My name is Sister Trixie Lavender, and I’m an occasionally possessed excommunicated nun. Okay, that’s a lot to swallow at once. But it’s true I was booted from the convent after doing something unspeakable. Something I had no control over. Something that lives inside me to this day, exploding out like that chestburster in Alien when I least suspect it. But I have help. My amazing friend Coop—the demon who saved me from an ugly end—remains by my side, loyal and true. She was Hell’s best tattoo artist back in the day, and together with my designs, we’re opening Inkerbelle’s Tattoos and Piercings, right in the heart of Portland’s most darling district, Cobbler Cove. Of course, our bid to fit in would be a little less rocky if I could help Coop assimilate with humans, keep a lid on our sassy talking owl, Livingston…oh, and if someone hadn’t killed our landlord on day one—in our shop. This new cozy mystery series from USA Today bestselling cozy mystery author Dakota Cassidy is sure to keep you on the edge of your seat as Trixie and Coop hunt for a killer. 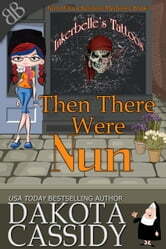 Then There Were Nun is book 1 in the all new, Nun of Your Business Mysteries series. 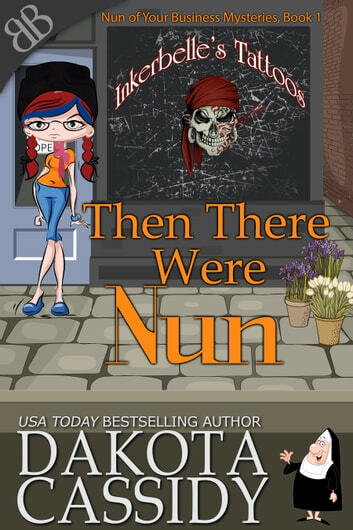 Then There Were Nun by Dakota Cassidy A paranormal cozy mystery spinoff, this is the first in a series A former nun and a demon open a tattoo parlor but when their landlord ends up dead in their new shop, it’s time for the detective hats to come out and solve The Who-done-it. It’s an irreverent and often funny read that is entertaining. In a G rated version which is unusual for this author. Trixie, the nun, is on a mission. Mostly just to support herself and her demon, but also now to solves murder mysteries and help friends and neighbors. Much of her language is straight from the most cliched stereo types but she is well meaning and loving so forgivable. Coop, the demon, trying hard to fit into society is adorable. A great start to a cozy mystery series. I look forward to the growing character base and finding out who the next one is to die and why the animals are talking. Excerpt of Trixie’s personality: “And in truth, if I let my character assessment of Higgs be my guide, he had a decent enough vibe about him. Or maybe he was simply a good actor. But maybe not… Cheese and rice, I was bad at this. I waffled more than a waffle maker.” Excerpt From Then There Were Nun by Dakota Cassidy This material may be protected by copyright.